A cruise ship with engine problems sent a mayday call off Norway’s western coast on Saturday as it desperately tried to avoid being grounded on the rocky coast. Rescue workers then launched a high-risk evacuation of the ship’s 1,300 passengers and crew, winching them one by one up to helicopters as heaving waves tossed the ship from side to side. The Norwegian newspaper VG said the Viking Sky cruise ship ran into propulsion problems as bad weather hit Norway’s coastal regions and the vessel started drifting toward land. Police in the western county of Moere og Romsdal said the crew, fearing the ship would run aground, managed to anchor in Hustadsvika Bay, between the western Norwegian cities of Alesund and Trondheim, so the evacuations could take place. Authorities told NRK that a strong storm with high waves was preventing rescue workers from using lifeboats or other vessels to take passengers ashore. “It’s a demanding exercise, because [passengers] have to hang in the air under a helicopter and there’s a very, very strong wind,” witness Odd Roar Lange told NRK at the site. 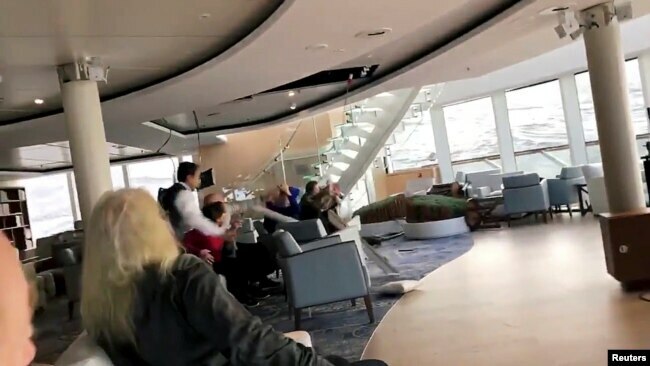 Video and photos from people on the ship showed it heaving, with chairs and other furniture dangerously rolling from side to side. Passengers were suited up in orange life vests, but the waves broke some windows and water flowed over the feet of some passengers.